1996 release 12 Golden Country Greats is the Pennsylvania duo’s 5th full-length but the first to stick to just one style which was, surprisingly enough, country music. That said, the title of the album is only half-correct as there’s actually only 10 songs here, why? You’ll have to ask Dean and Gene that one. Featuring some of Nashville’s greatest session musicians (including "Pig" Robbins, Charlie McCoy, and the Jordanaires), this is one of Ween’s finest records to date, with that classic Ween sense of humor filtered through a distinct countrypolitan sound. 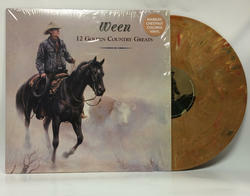 A classic reissued on marbled chestnut vinyl.